While one may think showing the grotesque, insane, or otherwise frightening face of the film’s antagonist would be ideal, most of the time, it’s a much more effective tactic to not show the antagonist. This can come in the form of leaving out the figure completely or with a somewhat less extreme method of showing the figure but strategically hiding its face. The Strangers is a movie that comes to mind with this topic. The faces of the criminals are never shown but rather hidden by dark shadows, under a mask, or by the angle of the camera. Such a tactic dehumanizes the criminals and makes the audience feel uncertain. The Babadook is another example. What’s underneath the cloak is not shown and it leads the audience to imagine the worst, which is worse than anything makeup or special effects could produce. Jump scares are nothing new to the horror genre. In fact, many recent movies rely mostly on this tactic to scare their audiences. Shame on them. While these kinds of scares are generally overused, nothing else can give a viewer such a concentrated burst of fear, making jump scares (with moderation!) a must in any horror film. Horror films can become predictable the more you watch them. Good films break those expectations formed from past horror movies as well as those formed from the current one being watched. Perhaps it’s simply holding a scene for longer than a viewer would expect like the flashlight in the basement scene in House at the End of the Street or perhaps it means breaking down everything the viewer perceived to be happening. Audiences now-a-days want unpredictable stories because it’s a waste of time if you can already predict what will happen. The use of a surprise twist helps to keep the audience engaged. Not only that but it brings excitement and an element of fear that comes with a new reality. 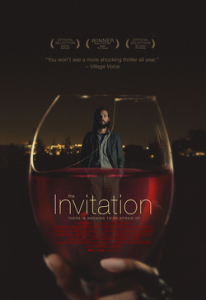 The Invitation does a great job of tying the viewers mentality to the main character’s in a way that the minute a twist occurs, the viewer’s perception shatters with the main character’s. Bottom line, a twist is satisfying.